A new research poll shows that Sen. Dianne Feinstein (D-California) is in a dead heat for re-election when matched with likely Republican challenger Michael Reagan. The poll by ccAdvertising shows that both Feinstein and Reagan each receive 38 percent of the vote with 24 percent undecided. Reagan, a conservative radio talk show host in San Diego, is the son of former U.S. President Ronald Reagan. His late sister Maureen launched a failed attempt for the same senate seat during the 1980’s. Feinstein, first elected in 1992, would be seeking her fourth full term in office should she remain a candidate in the 2012 election. The survey was conducted Sept, 25-26, 2011. This kind of stuff is up all over ccAdvertising’s home page. Before I post on this subject I would like to know who the client is ? Based on their prior clients, I would bet it is Reagan. I would not believe this poll, anyway. In the first place, ccadvertising does not list anywhere on the site that it does polling, nor does it describe even using polls. This looks like an advertising “press release” from ccadvertising. However, it does not name the polling group, so there is no way we can assess the poll for credibility. 20 QUESTIONS A JOURNALIST SHOULD ASK ABOUT A POLL (http://www.ncpp.org/?q=node/4) is a very good start at listing the kind of questions we should ask about a poll before we give it any credibility. In addition, unless the polling group provides access to the specific ways the poll was conducted, including statistical method used for analysis, how respondents were chosen, what manner of contact occurred, time of day and day of week phone calls were made. ***Hhow the poll was conducted, how it was analyzed statistically. ***How much information is released. ***How the information and analysis is spun in press releases. Another very important issue is whether the polling respondents were “registered voters” or specifically “likely to vote.” The “likely to vote” respondents will, on average, respond 5% to 7% more conservatively. The time of day and day of week is also important because phone calls made during the day and on the weekend are more likely to reach conservative voters. Even if they get Democratic Party respondents, those respondents will respond more conservatively. Finally, within the last 8 years, a critical piece of information about polling is whether respondents use primarily a land-line phone or cell-phone only. This is important because “land-line” only customers respond up to 13% more conservatively. Excluding cell-phone-only voters is excluding a significant segment of people who are more likely to be young and progressive. It is easy to find out if a poll included cell-phone-only voters because they will put it in BIG, BOLD LETTERS in their description of how the poll was conducted. This is because it is a lot more expensive to poll cell-phone-only voters. So if the polling company does it, they will let you know, big time, especially since the poll–all other things considered equally–is more likely to be accurate. I had a call about a year ago that was supposedly from Rassmussin (sp?). There wasn’t a a real person I was to push numbers on the phone to answer their questions. The questions were so blatently partisian. For example, one question was; Push 1 if you feel that Obama should be impeached now, push 2 if you feel that he should have been impeached after he passed the health care legistlation. Those were my only options (my wording but the same idea). What if I didn’t feel that he should be impeached at all?! I watch the polls but I don’t always trust them. My name is Nanci Meek and I support your bill. I am a private investigator. My career experience has helped to provide undeniable evidence of the fraudulent actions of a gaming profiteer. My story provides grounded reasons to amend the Indian Gaming Regulatory Act that has allowed such profiteers to fraudulently abuse exceptions of restoration and acknowledgement of tribes to acquire land for gaming. The “Tribal Gaming Eligibility Act” will require the Secretary of the interior to use strict criteria to make a determination of eligibility of land for gaming purposes as a first-step in the fee-to-trust process. This is important as restoration and acknowledgement overlaid by the exceptions in the Indian gaming regulatory act have created a political vacuum where there is ambiguity, confusion and profiteers waiting to create or manipulate newly developed Indian tribes to promote gaming. This is my personal story of a tribal gaming profiteer and the unfortunate investors, many who are senior citizens that were taken in by a multi-million dollar Ponzi scheme. While there have been many developers and investors with integrity, there are those who are nothing more than profiteers. One of the investors was my stepmother utilizing money obtained from cashing out our father’s stocks only three months after our father died. Through abuse of his trust by an attorney who was also one of four partners in a casino venture titled Pe Ji Ho Ta Casino. This is part of an ongoing scheme to bring a tribal casino to Salinas, California by a tribal group that was not even federally recognized and several questionable business men not part of the tribal group. In September of 2003 my father Elvin Meek, an attorney and two time Mayor of Rialto, California was diagnosed with a terminal illness. Telephone records reflect Attorney Robert Jones, a partner in the PeJiHoTa LLC was contacted by our father’s wife of 11 years, Elizabeth Meek, a Palauan native and non-American citizen while our father was in hospice care and asked to draft a Second Amendment to his original 1996 Trust as well as a pour over will. The circumstances surrounding his last days are suspect given Elizabeth Meek failed to contact myself, my brother, my daughter (Elvin’s granddaughter), several other family and friends to inform us of our dad’s condition. Phone records obtained will reflect during the months of August, September and October of 2003 several calls were placed to Robert Jones and his accountant Michael Gould but no calls were placed to family and friends. Calls placed by myself and my brother were ignored with the exception of one call placed on September 11, 2003 wherein my father sounded disoriented however we had no reason to fear he was in the shape he was in. A surprise visit by his long time friend of 35 years, Wes Stewart, on or about September 16th confirmed he was lethargic, bloated and incoherent. Medical Forensics prepared upon review of the medical records obtained concur he was 100% incapacitated and unable to utilize normal thought processes let alone execute documents. It is apparent Attorney Robert Jones was aware of his weakened state as was Elizabeth Meek and thus the opportunity to take advantage presented itself. It should be noted upon discovering we had obtained the medical records, Attorney Jones contacted my attorney in California and voiced his concern and objections to our having the medical records. My father, passed away on October 19, 2003. His trust executed in 1996 named me as the Trustee. Three months after he passed away, by virtue of a document drafted by Pe Ji Ho Ta partner Attorney Robert Jones drafted a Trust Certification for a previous trust dated 1992 which allowed our stepmother, Elizabeth Reklai Meek, to cash out our father’s stocks with Union Bank Cal. The check was in the amount of $646,481.96. Coincidentally this is the same amount almost to the penny of the buy in for the four principal investors in the PeJiHoTa Casino. Suspicion arose upon review of the Trust Certification which did not mention the Elvin R Meek Family Trust dated June 14, 1996. The 1st Amendment which a forensics report completed in 2008 concluded had forged signatures, essentially re-wrote our father’s original 1996 trust making Elizabeth Meek the sole trustee. Attorney Robert Jones presented to the courts in San Luis Obispo, in September of 2004 a document entitled the 1st Amendment to the Elvin R Meek Family Trust which was supposedly executed on September 16, 1997 and again according to Robert Jones affidavit executed November 10, 2005, another 1st Amendment was executed three days later in his offices in Atascadero, California. Our family was made aware of this document and for 3 years we asked for a copy of the document from the Bank of Hawaii, Robert Jones, and Elizabeth’s attorneys in Hawaii. None of whom would provide a copy to us. Upon finally receiving a copy of the questionable 1st Amendment signed in California it appeared the signatures had been forged. During an evidentiary hearing conducted in Hawaii on July 8th and 9th 2010, Elizabeth Meek admitted the signatures were not hers or my father’s. During this hearing Robert Jones admitted he did not know how the 1st Amendment with the forged signatures came to be in his offices nor did he recall signing the aforementioned affidavit. When questioned about the Pe Ji Ho Ta casino, Mr. Jones stated the corporation had since dissolved. It was confirmed several weeks later that the Pe Ji Ho Ta casino is not dissolved. According to the Motion for Authority To Compromise Controversy with Robert M Jones, Daniel Phillips, Chris Molina, PeJiHoTa LLC, PeJiHoTa of San Luis Obispo LLC filed in the United States Bankruptcy Court Northern District of Ohio Eastern Division of Akron entitled In re: Kelly V Gearhart and Tamara Lowe debtors executed on July 21, 2010 the casino venture Pe Ji Ho Ta is active. In July, 2010, Ohio Bankruptcy Court Judge Marilyn Shea Stonum ordered Jones, Molina and Phillips to pay the bankruptcy trustees $20,000 to cover their costs of investigating Pejihota, to provide the trustees one fourth ownership in Pejihota with the right to buy back the trustee’s interest in the project by reimbursing Gearhart’s investment into Pejihota, $646,190. In March of 2005 the Bank of Hawaii accepted co-trusteeship of the Estate. A few months later in July of 2005 Judge Tangeman in San Luis Obispo granted Attorney Robert Jones’ petition to move the probate case to Hawaii stating the Bank of Hawaii could only serve as co-trustee if the matter were in the state of Hawaii. We have always questioned why Attorney Robert Jones opened the probate in California since our father died in Hawaii and had been a Hawaiian resident since 1996. It should be noted only one month after the case was moved to Hawaii, Elizabeth Meek’s citizenship was finalized in August of 2005. By virtue of her citizenship being finalized, she would no longer need a co-trustee and yet Robert Jones and the Bank of Hawaii continued to move forward, selling properties and attempting to dissolve our father’s estate without notifying myself or my brother. The Bank of Hawaii held the position of co-trustee for three years before asking the court to be removed. None of the Trusts mentioned in the 1st Amendment were ever funded by the Bank of Hawaii. An audit was performed by the IRS in 2007 due to the non filing of income tax returns by Robert Jones and the Bank of Hawaii. After several years and several requests the beneficiaries did not receive an accounting of the estate until 2008. The accounting prepared in 2008 does reflect the money from the sale of the stock was placed in two CD’s however we have for years asked for documentation which would support this and Elizabeth along with her attorneys in Hawaii refuse to provide this to us. Therefore we question the validity of the handling of the money from the stock check. Several suspicions have arisen over the years relative to the conduct of Attorney Robert Jones. He did not contact me or my brother, Melvin Meek, until after two properties were in the process of being sold. One of which was in Arkansas and as a result of the Jones not being thorough with a title search on the Arkansas property, a judgment against the estate was granted in the amount of $311,204.00. It would appear Attorney Robert Jones acted in haste to assist Elizabeth in selling several of our father’s properties including one in Rialto, California (before a probate was legally opened in California) also a property in Hesperia, California, as well as the sale of the Arkansas property which had been in our family for close to 100 years, without contacting myself or my brother. Myself and my brother received a letter from Robert Jones in August of 2004 asking us to not contact Elizabeth Meek (“who does not feel comfortable speaking with you or Melvin for reasons known only to her”) and to have all calls and inquiries relative to the estate go through his offices. For the next several years repeated phone calls and correspondence to Attorney Robert Jones in Atascadero, California were ignored. In April of 2008 I filed a police report with the Atascadero police Department for fraud with respect to the questionable signatures on the 1st Amendment to our father’s trust. Detective Pflum investigated the case and submitted his findings to the San Luis Obispo District Attorney’s office. Among those findings were the Affidavit wherein Attorney Jones admitted the 1st Amendment was signed twice, once in Hawaii and three days later in California. We also submitted our forensics report prepared by Reed Hayes in Hawaii and concluding the signatures were forged. On March 6, 2011 I received a letter from Assistant District Attorney Jerret Gran stating they would not be moving on the allegations against Robert Jones due to lack of evidence. One could reasonably conclude Attorney Robert Jones, a partner with three others in the PeJiHoTa casino venture which has had several different LLC filings over the years both in California and in Nevada was motivated by greed and saw an opportunity to compromise our father’s intentions outlined in his original 1996 trust as well as his weakened condition, in an effort to gain control over our father’s estate and profit accordingly. Because of Attorney Robert Jones mishandling of our father’s trust close to $200,000 has been paid out of the trust in legal fees to himself and attorneys for Bank of Hawaii. Also the aforementioned judgment in the amount of $311,204.00 against the estate for the sale of the Arkansas property has not been satisfied. I thank you again for the hard work of your staff but most of all your political will to address this controversial issue of reservation shopping to protect all citizens, tribal and non-tribal of California. I hope he decides to run! We need citizen politicians who have experience in the real world! Allthough I have zero faith in Californians to vote for him. We have 32% of US welfare recipients and we are only 12% of the US population. We have an extremely large group of public employees unions. Neither of these groups will vote for someone who would fight waste and fraud. Seems like every time Feinstein has run she’s been tied in the polling with the most likely Republican candidate. Few remember that she was nominated the first timeshe ran in the primary when the Democratic Party had endorsed another candidate. What may be most telling about the race is that no Republican who is well known in California appears to be preparing to run for U.S. Senate. Well, it is about time Feinstein had some competition… competition makes us all better. I think I have a conservative side, too… but no side of me has much respect for her accomplishments. She has been a big part of the military bashing and I question if working people can have ‘friends’ like her in office when they are part of the system of sending American jobs overseas. I don’t know MR … but at this stage of the game it’s either ‘none-of-the-above’ or ‘anybody-but-Feinstein”. She garners only the extreme left nowadays…. you know… the real wacko cat ladies and such. You are wrong about Feinstein’s supporters. The left recognizes her for what she is: a Republican running under the Democratic Party’s banner. She is no friend to the left. She is BIG buddies with those who want to drill off California’s coast, however. been the best choice to date. Would love to see a real progressive Dem there one day soon. Feistein is pretty pragmatic and even my conservative side likes her. I remember how she helped move a bill forward to ban convicted felons from possessing body armor. this was in response to a police officers death in San Francisco by a gunman who was protected with a ballistic vest and helmet. The Officer was a graduate of SLOHS. I ganed a lot of respect for Feinstein. 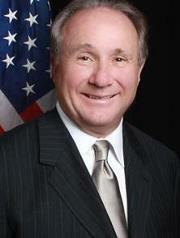 As far as Michael Reagan goes … I like his Dad but what the heck has he himself done? I’ve read that Reagan said he wouldn’t run. Hard to imagine why any voter would think he’s qualified. His career, such as it is, would never have happened if his name was Jones. Feinstein is a Republican. She runs under the Democratic Party banner, but she is a Republican. She is NO friend to the environment. She voted to confirm Gale Norton, after meeting with her once and then saying she thought Norton would do a good job. One of the first things Norton did was to start the process to opening up the California coast to oil drilling. Like Obama, Feinstein works harder to support the Republican/neocon agenda than they do to support Democratic Party values, and our state and country has suffered because of it. While Feinstein’s history of ignoring her campaign promises once elected does not come near to beating the failure of our Bait-and-Switch Scam Artist President Obama, Feinstein certainly is in the running for second place. I walked precincts (something I LOATHE doing) to get Feinstein elected, and so I take her GOP and oil-company brown-nosing kinda personally. As to the suitability of Reagan…I don’t know that much about him, but I do believe today’s Republicans are nothing like the old-school Republicans who were simply conservative in their positions, and not raving theocratic-fascist nincompoops like we see today in the Republican Party. However, if my choice is between Feinstein, again, and Reagan, then I’ll refuse both. I’m done with wasting my votes on bait-and-switch scam-artist politicians. Now Barbara Boxer…I’d walk a mile in tight shoes to vote for her. But then, she’s an actual Democrat, and she doesn’t con voters by promising one thing and delivering another. Boxer is anything but stupid. She’s a liberal and she stands behind what she promises in her campaigns. I know standing behind campaign promises is something that is a foreign concept for many Republicans, but for us “rule-of-law” folks, it is very important. First of all, I’m not a Republican and yes even the San Francisco Chronicle wouldn’t endorse her. Think about that, The San Francisco Chronicle, which stated she is ineffective and unfit for the job. Please list for me her legislative accomplishments. Please don’t include any chicken little “global warming” nonsense. Some ‘liberal baiting’ name calling type comments have been deleted, Try again. Be polite, this is a community conversation comment as if you are part of it. ps. conservative bait also deleted. I really do like Boxer, she’s very smart and appears to be ethical. Now this we can agree on. Golden Gate National Recreation Area – Added 4,500 acres of pristine natural land to GGNRA in San Mateo County including a 4,076 acre parcel known as the Rancho Corral de Tierra. Redwood National Park – Added 25,500 acres of land known as the Mill Creek property to Redwood National Park in Del Norte County. In addition to the Mill Creek property, this bill will bring about 900 acres of land within the park boundary. Yosemite Schools – Authorized the National Park Service to provide supplemental funding for three small schools in the Bass Lake Joint Union Elementary and Mariposa Unified School Districts, which are located in Yosemite National Park. Criminalizing Border Tunnels – Criminalized the act of constructing or financing a tunnel or subterranean passage across an international border into the United States. There is no law currently on the books that makes it illegal to build, use, or finance such tunnels. (S. 2355, introduced with Senator Jon Kyl on 3/1/06. First approved by the Senate as part of the Senate comprehensive immigration reform package on 5/26/06. Later incorporated into the FY’07 Homeland Security Appropriations bill; P.L. 109-295, 10/4/06).